Heroes for a Loser Class. 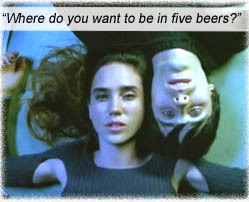 If you’ve never done hard drugs before, REQUIEM FOR A DREAM will make sure you don’t. If you’ve puked your guts out over your bed, stayed unwashed for a month straight, and sold your mother’s TV for a fix, well, REQUIEM FOR A DREAM is like last Wednesday. To say Darren Aronofsky‘s unflinching mind-bender is an intense cinematic experience is to sell it short – it is a scooping out of your intestines and playing with them before trying to squeeze them back into your torso, all while you’re conscious. Jared Leto and Jennifer Connelly are two young lovers (Harry and Marion) hooked on heroin and dreaming big, nebulous dreams of saving their drug-dealing money to buy a business. Marlon Wayans is their junkie friend, Tyrone, along for the pipe dream. Ellen Burstyn is Harry’s pill-popping mother, Sara, enamored with an afternoon television game show enough to hallucinate herself into it. Aronofsky shines his glaring light not just on the emptiness and false hope of heroin addiction, but on the seemingly innocuous addictions of prescription drugs. While Harry, Marion and Tyrone run the gamut of heroin’s follies (street killings, their “savings” dwindling to nothing while promising themselves they’ll make it back with One Big Score, being driven to prostitution, gangrene from needle overuse), Sara becomes obsessed with losing weight via pills to fit into a red dress for an imagined TV appearance – by the time the dress fits her skeletal frame, nothing really matters anymore. Burstyn’s bravura performance admitting truths about the emptiness of old peoples’ lives is scary. It is astounding how deep she goes. When Harry discovers his mum is popping weight pills, he lectures her, “You don’t wanna turn into a dope fiend.” Of course, this hypocrisy falls on deaf ears. Aronofsky is an emotive film-maker. Everything that comes at us from the screen is geared towards stirring our innards, presented in the most jarring manner possible. Yet Aronofsky does not try to shock with the actual taking of the drugs, like TRAINSPOTTING; instead, whenever his characters fix, it is purveyed in a few crash cuts of iconic visuals. Makes it all the more effective, focusing on the consequences. With composer Clint Mansell and the Kronos Quartet evoking darkness and disturbia, REQUIEM touches nerves we thought we’d wiped from our memory in young rock bands and college parties and street denizens spouting all the same inanities, like listening to people in jail holding cells, all saying the same things so many times (“What are you in for?” “It wasn’t my fault”) that it becomes physically nauseous. In most movies when down-and-out characters proclaim they’re going to Buy That Store or Make That Score, it serves the story arc to achieve their goals – in REQUIEM, the characters are doomed to fail. That’s the way junkies are built – all the platitudes in the world cannot change their nature. As a reformed alcoholic once told me: “Every alcoholic is between drinks.” Which doesn’t bode well for the inherent nature of humanity. Two years after telling me this, she proved it. Writer: Hubert Selby Jr., Darren Aronofsky. Starring: Ellen Burstyn, Jared Leto, Jennifer Connelly, Marlon Wayans, Christopher McDonald, Dylan Baker, Mark Margolis, Sean Gulette, Ajay Naidu, Keith David, Ben Shenkman.